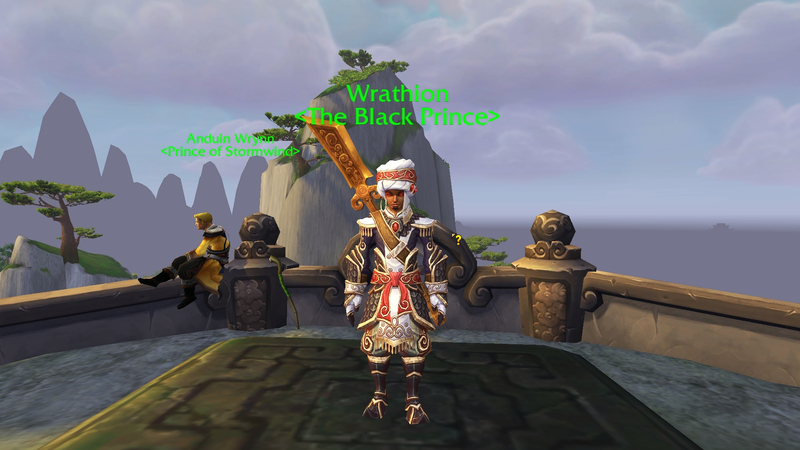 Wrathion: You are a superb representative of your people, (race). But I need someone special. I have big plans. And to enact them I will need a champion to carry my flame to the four corners of the world. Wrathion: My Shado-Pan associates have spoken highly of your deeds. You have earned quite the name for yourself here in Pandaria! 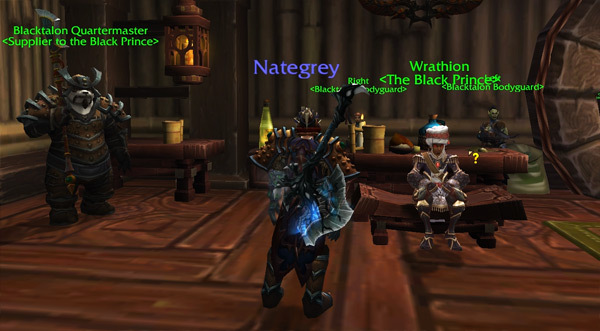 Wrathion: There’s an Alliance dwarf I’ve been keeping a close eye on. 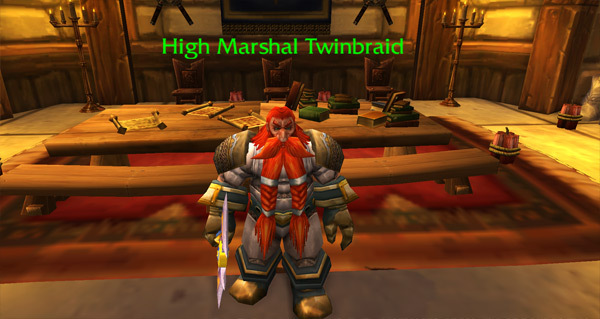 High Marshal Twinbraid proved to be a nuisance in Southern Barrens when he struck back at the Horde after the loss of Bael Modan. He’s now entrenched within the Alliance stronghold in Lion’s Landing, helping to orchestrate the Krasarang counter-offensive. Kill High Marshal Twinbraid at Lion’s Landing in Krasarang Wilds. You will need a group. 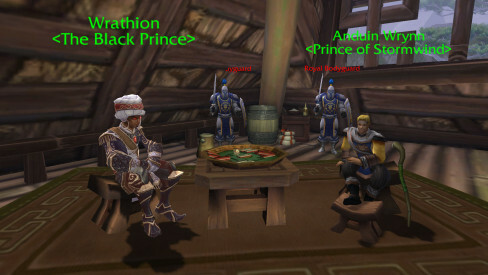 Wrathion: So, General Twinbraid is dead? He was a pivotal figure in the Alliance push through Southern Barrens, impressive work. Wrathion: You were being tested, (class). I knew you were capable of great things by yourself. 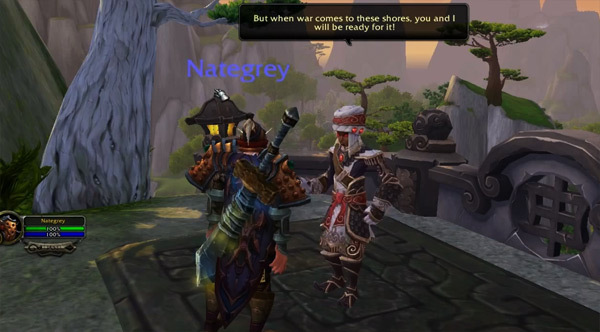 Wrathion: This is a global war, . It has spilled onto Pandaria, and it has set hot spots across Kalimdor and the Eastern Kingdoms ablaze. How will you fare on an organized battlefront? I would like to see for myself. Ohh… oh! Incredible! In the very eye of battle, one’s true heart is revealed. You do not disappoint, (name). Neither does this Horde of yours. Wrathion: My goal is an expedient end to this costly war. Prove to me that the Horde deserves to win. Show me your prowess on the battlefied. You are not fighting some abstract force like the sha: You are facing your enemy head-on, eye-to-eye. Kill Alliance forces along the southern shores of Krasarang Wilds until you are Revered with the Black Prince. Wrathion: Welcome back, champion of the Horde! How fares the battle along the coast? Marvelous! Even in the midst of the chaos of battle you’ve proven that an individual can have an impact. 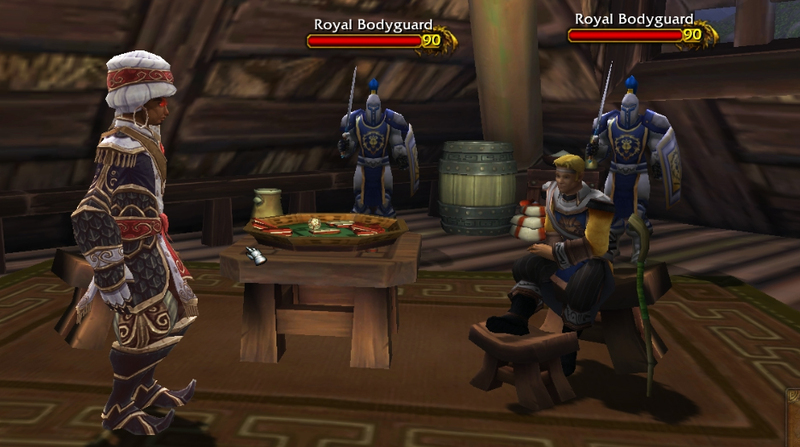 The Alliance buckles under Horde might, although their King refuses to break. There! My eye is upon you, (class). I am watching. The Pandaren, like the Alliance, value the concept of “Valor.” There are many ways to prove yourself valorous on this continent, from daily tasks to the defeat of heroic enemies within their lair. I will let you choose your own course. Prove your bravery to me, (name)! Gain the “A Test of Valor” Achievement by earning a total of 3000 Valor Points. Note: Takes about 3 weeks to complete by reaching the Valor cap (1000) each week. Thus make sure not to spend your Valor Points for a while if you are at the Krasarang Wilds PvE Landfall part (Incoming…). Yes, (name). I saw your deeds, and I was most impressed. You are truly an instrument of change. His time has passed, . We should claim some of his power for ourselves. 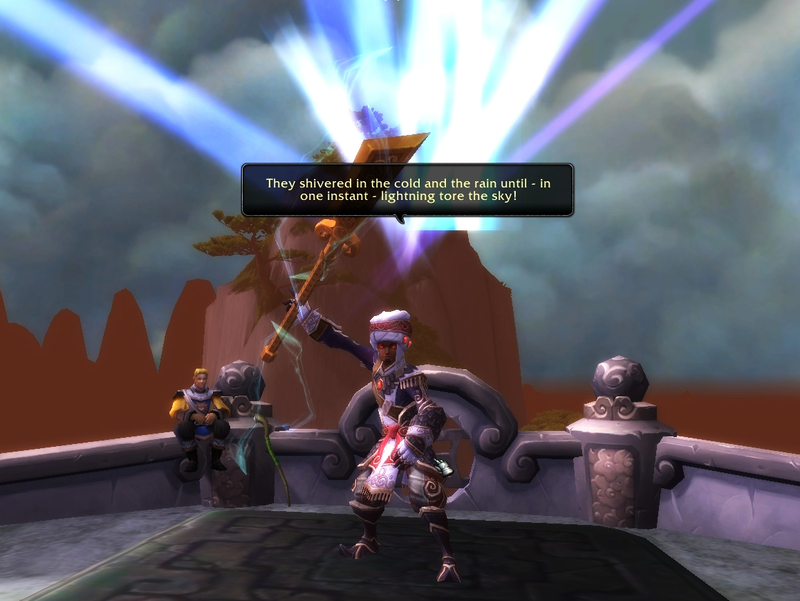 Gather mogu relics for me from the Throne of Thunder, and amass some trillium – I have a plan! Wrathion: What have you uncovered from the Throne of Thunder? Is the Thunder King’s ferocious reputation warranted? Wrathion: Well done. The trillium will need additional refinement, of course, but these samples are pure. Wrathion: I have on good authority that you are a champion among champions, but if you’ll permit me this indulgence, I would like to test your mettle for myself. The mogu who assault the Vale of Eternal Blossoms, the mogu minions who inhabit Shan’ze Dao, and the sha-corrupted mantid swarming the Dread Wastes… these may provide an adequate challenge for one of your stature. Prove yourself to me. No rush – I expect this to take you some time. Earn an Honored Reputation with the Black Prince. Level 90 mogu and mantid in the Vale of Eternal Blossoms, Townlong Steppes and the Dread Wastes will earn reputation. Wrathion: Marvelous. That did not take long at all. Word of your many achievements has been the talk of the Vale! Very well, I will take you under my wing. Wrathion: Great leadership requires the power to shape the destiny of your people, and the wisdom to make the right decisions. 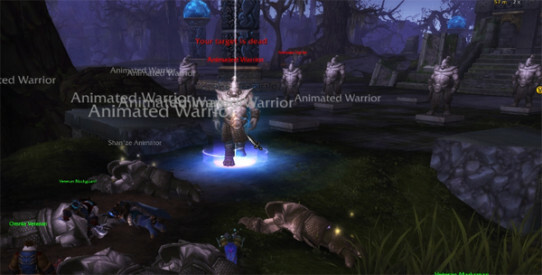 Pandaria boasts great power and ancient wisdom, but rarely in the same place. Let’s see if you and I can change that! Acquire sigils of power and wisdom from fallen foes in the Mogu’shan Vaults, the Heart of Fear, or the Terrace of Endless Spring. We will put them to a much better use than their current owners. Wrathion: Sigils of wisdom will often be found on practitioners of the arcane arts, while sigils of power are usually found on those who favor brute strength. Wrathion: My friend – you do not disappoint! Wrathion: You are among a rare breed, . You are just what I am looking for – an individual with the potential to shape events on a global scale. Come now, I promised you a reward, and you shall have it! East of this tavern is a series of stone steps leading up to a vista that the locals have named “Mason’s Folly.” Meet me there. 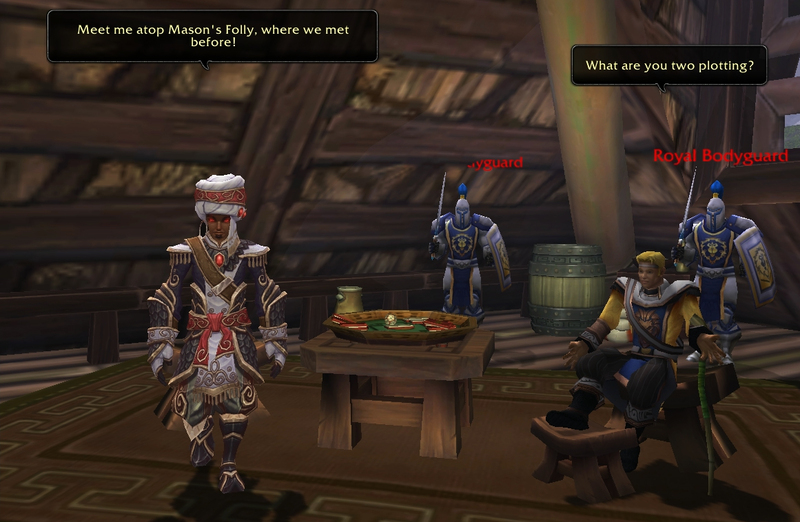 Go to the top of the stone steps at Mason’s Folly and meet Wrathion there to accept your reward. Wrathion: I often venture out here to think, the view is breathtaking, would you agree? Pandaria is indeed a jewel. Such beauty. It makes you want to protect her, yes? I feel the same way about Azeroth herself. You have done great things friend. I can assure you this is but the beginning of our work together. Behold: The power of the foes you’ve vanquished. And the wisdom of those you’ve outsmarted. Here! The embodiment of the fear that you’ve conquered. May it now strike terror into the hearts of your enemies! Finally, a gift from me. 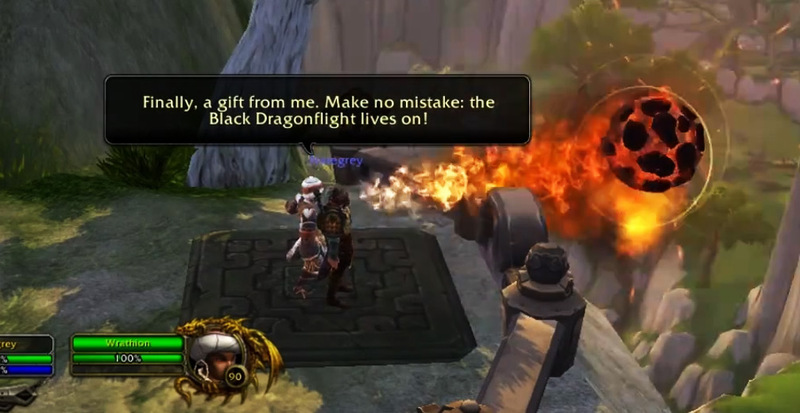 Make no mistake: The Black Dragonflight lives on! There. My work is done. You can now greatly augment the power of any sha-touched weapon. Wrathion: We are just getting started, friend! Our greatest challenges lie ahead. But when war comes to these shores, you and I will be ready for it. Wrathion: You have earned this, ! Use it well. Wrathion: Please understand, I mean to pay off my father’s debts. I will stop at NOTHING to defend this world. In the future, if you are ever uncertain, you are welcome to question my means. But never question my motives. The safety of this world is my primary concern. Now then, let’s talk about current events. Is that true? Let’s find out. The Sha of Fear has fled into the Terrace of Endless Spring. Pursue it there, defeat it, and rip out its spirit – presuming it has one. Wrathion: The Terrace is just up the hill here. Stay on your guard; few visitors have returned. 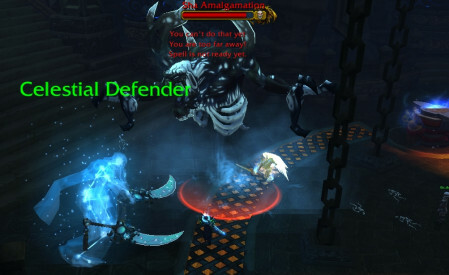 Note: Queue for a Terrace of the Endless Spring LFR raid. After killing the Sha of Fear make sure to click the corpse to loot the Chimera of Fear. 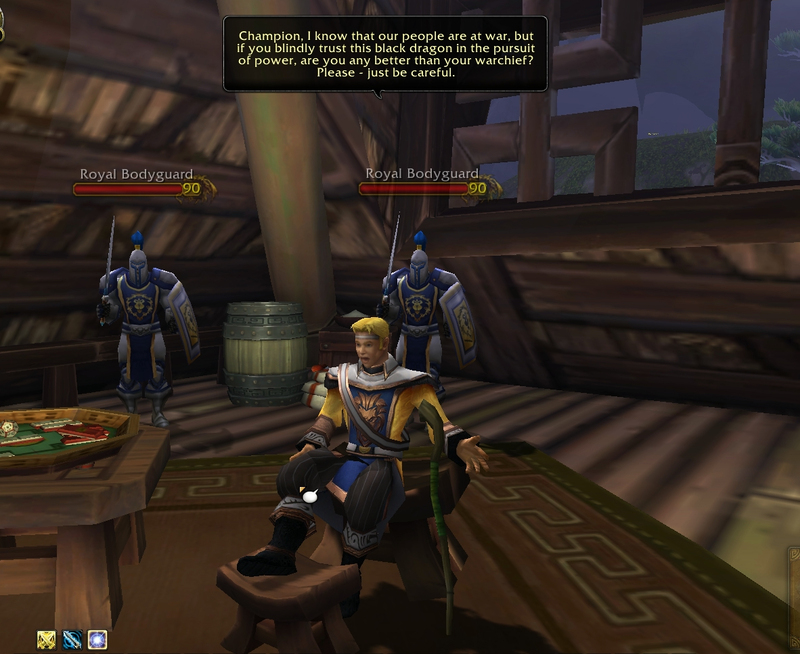 Wrathion: You are looking pale, my friend! I trust you have not allowed fear to get the better of you? 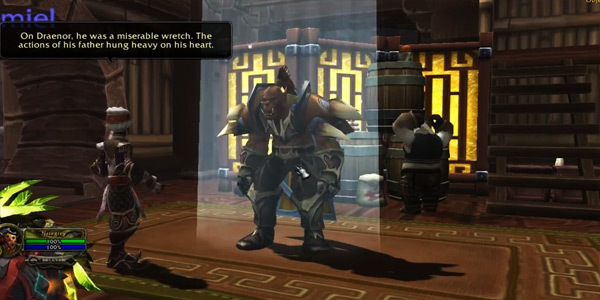 Wrathion: Another bit of pandaren wisdom: “Fear is not a criminal we must lock away. It is a teacher we must seek to understand.” In facing our fears, we gain great strength. Have you faced your fears, (name)? Wrathion: You have done it! Wrathion: Our world finds itself at a crossroads. The next few months will shape everything to come – presuming we are to have a future at all. Ah! But I am getting ahead of myself. Let me back up. Come, share a drink with me. 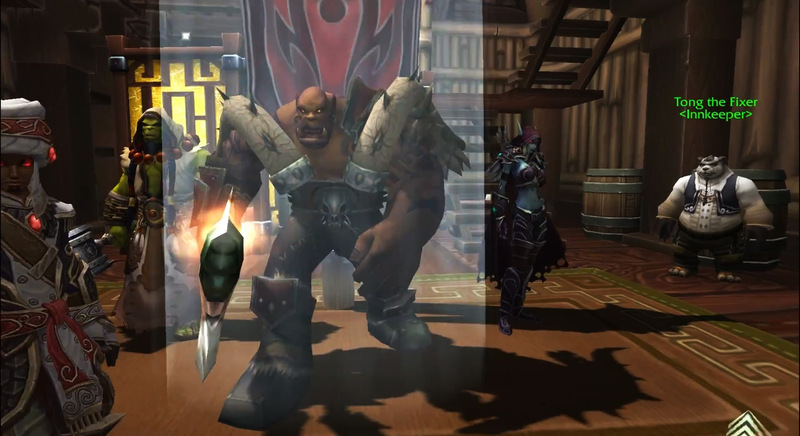 Let’s talk about the future of Azeroth. Wrathion: Very good. Let’s talk. Tong! Drinks, please. 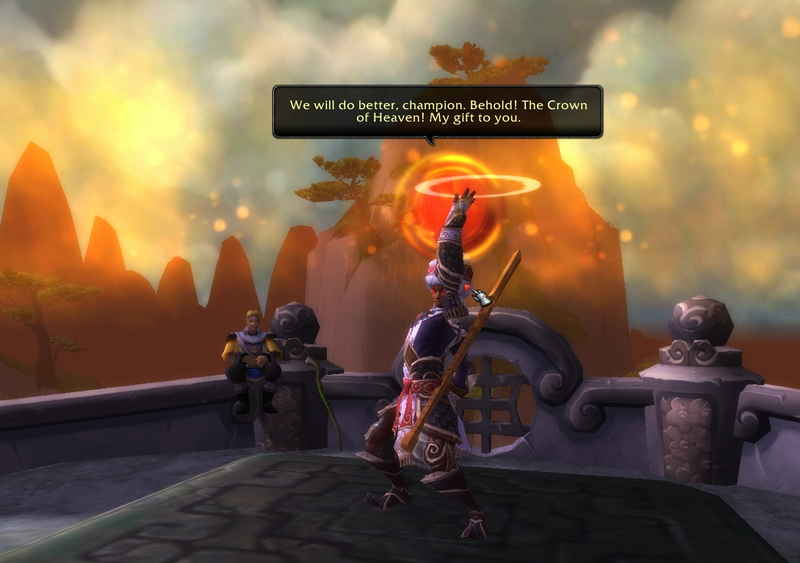 My father, Deathwing, tried to destroy the whole of Azeroth. He was misguided, of course, but he was right about one thing: Our world is… so fragile. We are a point of light in a universe of shadow. A candle in a tempest. Sometimes I think it was the very precariousness of our world that drove my father to madness. Now, to my point. I believe we are headed towards a reckoning. And no, I am not talking about the current conflict between the Alliance and Horde. Believe me – what Garrosh Hellscream achieved in Theramore is nothing compared to the horrors that are even now bearing down on our fragile home. But the war deeply troubles me. Do you see my concern? A divided Azeroth cannot possibly stand against the darkness. The war has to end. Soon. Before it consumes our strength! You can rest assured that my loyalties lie with your Horde. How do we bring a swift and decisive end to the conflict? I believe the answer lies with heroes like you. We must ensure that you are up to the task… and then equip you accordingly. 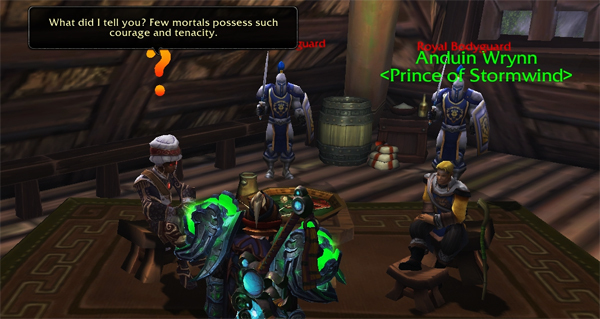 Wrathion: Of course, I must ask your discretion regarding what we just talked about. We wouldn’t want to alarm anyone who is, shall we say, less capable than yourself. 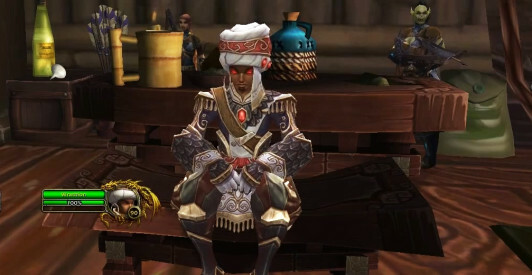 Two quests become available after turning in this quest: Trial of the Black Prince and The Strength of One’s Foes. Excuse me, (class). Is your name (name)? A figure in a dark cloak asked that I give this to you. She was a traveler from beyond the mists, like yourself, but – well, I didn’t trust her. The message comes from a tavern in the veiled stair. I’ll give you the note but… you should watch your back if you venture up there! Seek out “The Black Prince” at the Tavern in the Mists in the Veiled Stair. 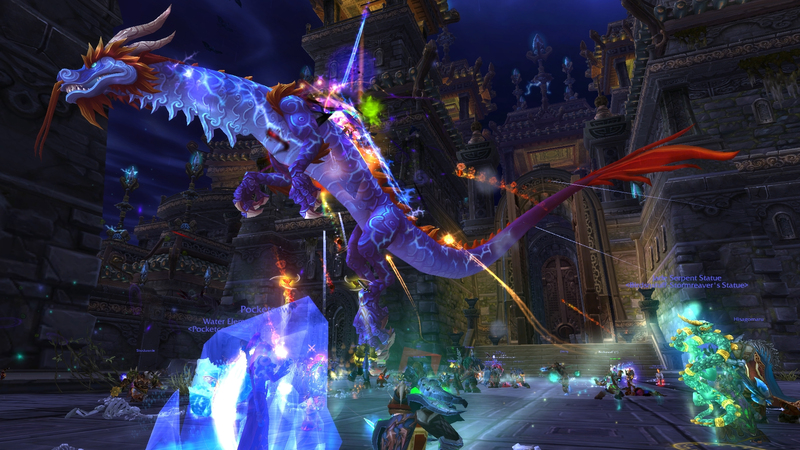 All is quiet on Pandaria – for the moment – but world events are developing quickly. Help me to shape the course of the upcoming conflict and you will be generously rewarded. Wrathion: So, my note found its way to you! Wrathion: My people have done their job and brought you to me. Wonderful. Wrathion: Certainly I’m allowed to have SOME secrets. Wouldn’t you agree, ? I arrived shortly after the mists collapsed – I was able to fly here after my Ravenholdt colleagues learned of a naval battle off of these shores. This land has been hidden for ten thousand years. I’ve only just begun to plumb its depths! Wrathion: It is very good to meet you, (class). You are one of the vanguard, it would seem – an explorer in a strange new land. 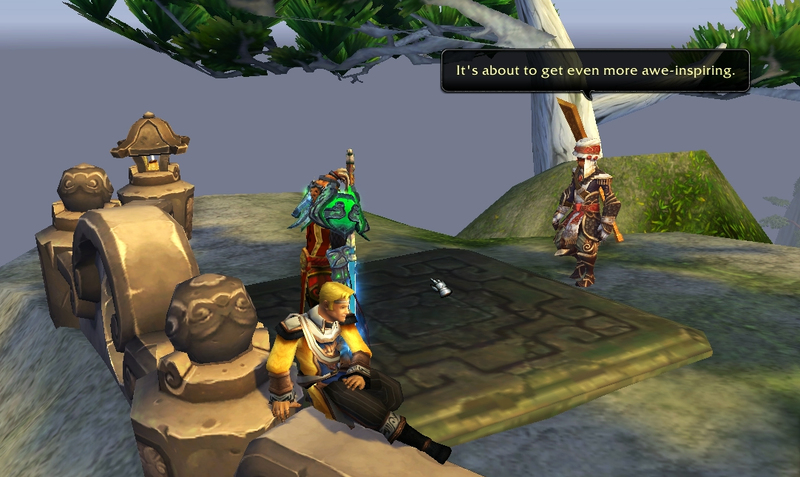 And how have you been finding the mysterious continent of Pandaria? You have the look of someone who gets things done. I want you to return to me once you’ve gotten the lay of the land. Wrathion: I have chosen the name “Wrathion.” To my knowledge, I am the last of the black dragons. My father was Deathwing, the Worldbreaker, the Aspect of Death, the Destroyer … But I hope you will not hold that against me. Let’s just say, I am … unaffiliated. And I am always on the lookout for like-minded heroes.